Wow, this has been really tough. I really enjoyed seeing everyone’s take on the theme of seasons. I wanted to have something a little different, with any subject fair game as long as the season was obvious, and I think the entries fulfilled that aim. We got a lot of scenery, but also people, wildlife, and activities. All good. I’ll keep up with the trend of comments for everyone who entered. I always enjoy reading them, especially (constructive) criticism of my photos so I figure I should keep it up when it’s my turn. @Cavalier, you gave me another excellent set. I liked all three of them and I was tempted by the autumn colors among the evergreens, but I think I like the crisp feel of Winter in the Sierras. I really like the snow covered branches along the stream. @sarasphotos, I really enjoyed your take on the challenge. I enjoyed seeing your balcony view under different conditions (and I really envy you that view). While I really like the pencil sketch appearance of the snowstorm, I think I like the Morning Frost photo the best of your entries. The pano crop and the low light angle really give me a sense of the crisp morning air and a feeling that I am right there. @pegelli, I like that you also entered a photo near your house. The yellow flowers (jonquils?) are so cheerful—just what one needs after winter. And while your Lapland photo really shows winter’s icy cold very well, I think my favorite is the Summer in Bretagne, France. I can just imagine hiking to that location and then just sitting and enjoying the view and the feel of the sun. @DavidRGillespie, Ah, snowdrops. They really define spring, or at least the promise of spring. And I really like seeing them just as you show them, pushing their way up out of the snow. But the one that really made me smile is the picture of your granddaughter at the lake in summer. She is really showing what summer is all about when you are young. @grandmaR, I had to laugh at your winter photo. It never seems to fail when I look at a field of new fallen snow there is always one brave or foolhardy creature that has wandered through it. But in the end I really like the popping color of your Vermont fall photo. Bonus comment: I always enjoy when you post one of your father’s photos. It reminds me of my father who saw what I was doing with my instamatic camera while I was in college and encouraged me to get an SLR. Good memories. @schmad, A cardinal at a birdfeeder in the snow. What a great image of winter. I also liked the motion blur on the wings of the incoming bird. Very nice. @roaddog52, I had to look up the Red Ants Pants Music Festival. What a great event, and part of the proceeds go to good causes as well. I think I have to add another item to my “Have to See” list. But as far as conveying the sense of a season I have to go with your third entry, Winter Ice Fishing. The solitude of this image and the great expanse of ice and snow really got me. My feet felt cold just looking at it. Obviously Montana style isn’t for sissies or the people who pull cabins out onto the lakes. @lkbart, I really like Bluebonnet Season in Texas. That field just looks like it goes on forever, and I can see that the small magenta flowers go right on with the bluebonnets. I think I’m going to have to go to Texas some spring to see one of those fields. So, after a lot of thought, here are the results. Seriously, there were so many photos that fit the idea of this challenge so well I could have picked any or all of the photos. But that would have been chaos so this is what I came up with. @Cavalier Winter in the Sierras. Jo, your photo reminds me of several winter trips I took to Yosemite years ago when I lived in California. @sarasphotos Morning Frost on the Trees. Sara, the crisp sense of a clear winter morning was conveyed very well in this photo. @schmad. Winter (birds and bird feeder). 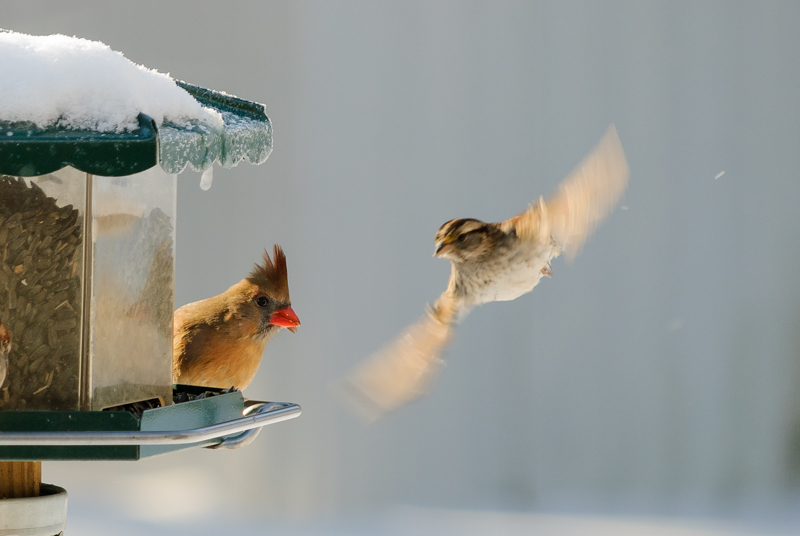 The completely soft background really focuses the attention on the birds and the snow covered feeder. @DavidRGillespie, Summer (at a local lake with Granddaughter). 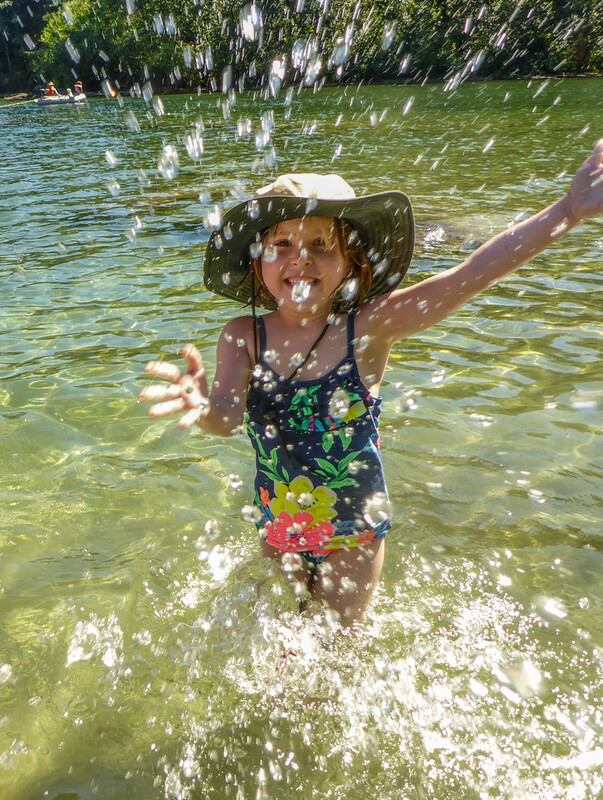 Dave, I think this photo captures the essence of a great summer day—for the young and young at heart. I’m still smiling. The next challenge is yours. This was a great idea and I also am envious of Sara's view. (The tracks in the snow photo was also taken from my bedroom window but it is difficult to take photos there because the windows are covered with plastic storm windows.) I notice that you picked all winter photos except for the winner which was summer (IMHO the hardest one to photograph). Thanks for running the mini and for the comments. What a wonderful set of images to look at and very thoughtful comments. Thanks so much for the win Barbara @bfluegie , and congratulations to @schmad, @sarasphotos and @Cavalier for the second and third places. I will get something up for the next challenge very shortly. @bfluegie Barbara, great work on the challenge and thank you for taking the time for commenting on each of the entries. Congratulations to @DavidRGillespie, @schmad, @sarasphotos and @Cavalier for your placings in this challenge. Kudos to all who entered, awesome images everyone! Honored to tie third place with Sara's beautiful winter scene - thanks Barbara. And for taking the time to comment on all the entries,. Congratulations David for a spectacular shot of summer! Barbara, thanks for the third place and congratulations to @DavidRGillespie and the other winners. It was a very interesting mini with great entries - and the comments are always appreciated. ...and believe me, we are thankful for our fabulous view every single day! Congratulation to the winners. Barbara, this was a great challenge, and you were wonderful to comment on all the entries. Thanks to all that played along. Congrats David, well deserved! Cheerful and sunny and the perfect summer spirit. Also congrats to the other honourable places and thanks to Barbara for a nice challenge and all the comments. Congrats David, great fun shot! & congrats to schmad (& welcome to the minis! ), & to Sara & Jo for the places - all great shots! Great mini idea & thanks for the comments! Great job Barbara!